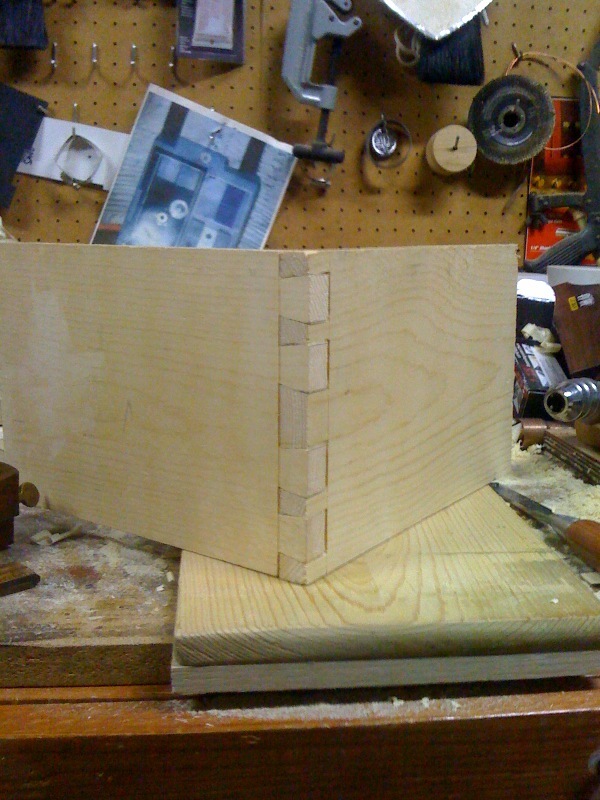 One of the things you read about when reading about hand tool woodworking is Dovetails. Over and over you see and hear about them, and it’s clear that it’s a basic skill of the hand tool set. So I set out to try these things, to learn what I needed to learn as it were. At some point you have to stop reading and start doing, so you can really and truly learn the skill. Tonight I put it into practice, here are the pictures so you can bask in my learning and witness my mistakes. I’m working in Pine board I had from a previous project. I’m using a no name back saw that I found at a Goodwill store (talk about humble beginnings, eh?) to do the cutting. I had a low end Japanese pull saw, but it’s teeth shattered off in some Purpleheart during my holiday present making. The only other saw I have is a cheap mitre box saw that is nearly useless for cutting. I’ve been researching saws like crazy, but for now I’ll work with what I have. First attempt, doesn’t look so hot does it? The layout, and sawing of the tails went ok, the chiseling out of the waste went ok, but I made a major mistake on cutting the pins. I didn’t pay attention to which side of the line I was cutting. I had marked the waste (after a close call) on the sides, but I didn’t mark the tops. Second attempt, looks much better by far. I marked ALL sides of the waste this time, and was a bit too conservative in my cuts which resulted in too much wood on the pins. 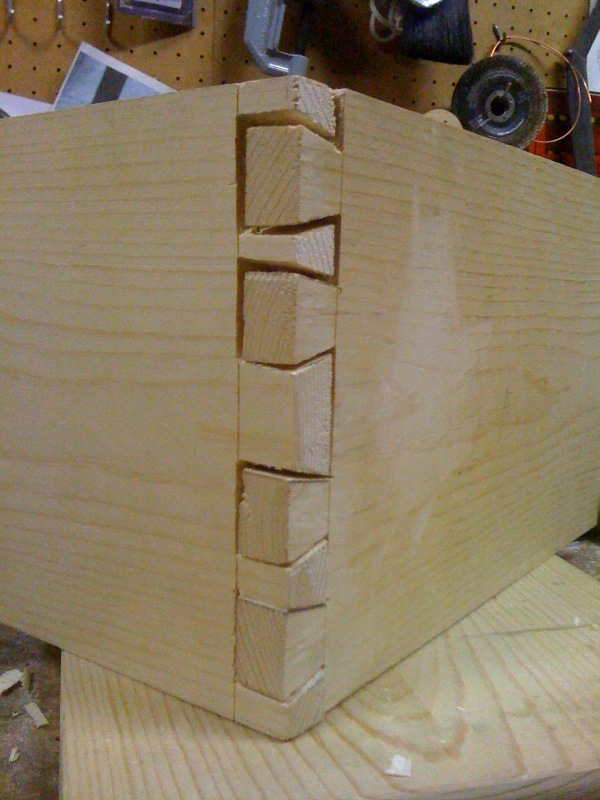 Which is better than not enough, because I chiseled it down to fit and got a much nicer fit this time. 1. Mark all sides of the board end with marking gauge by the thickness of the board and then a little more. 2. 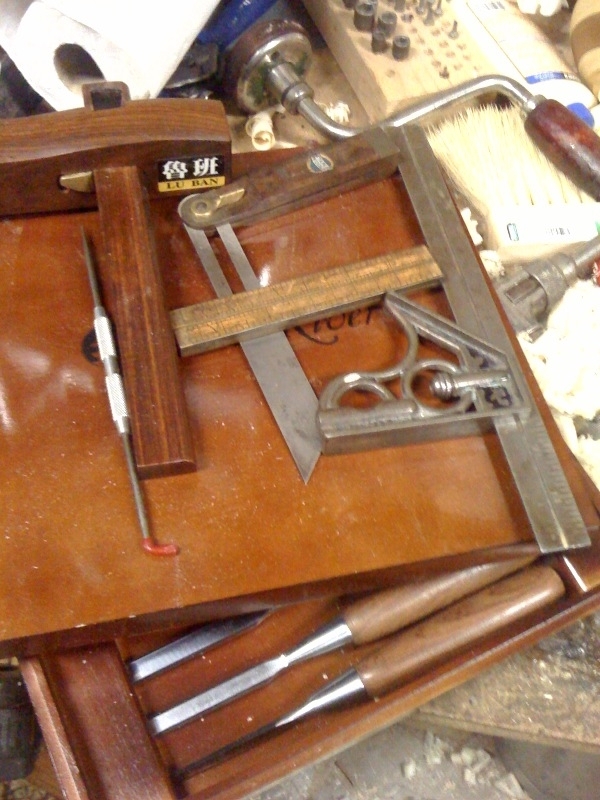 Lay out pins, using a 1:6 dovetail with the Stanley bevel gauge. 3. Clamp up the board, and cut the tails, then cut the waste off the side with the back saw. 4. Lay tail board down on bench hook, and cut down into the waste with bench chisels, flip over repeat until you can pop out the waste. 5. Clean up inside of tails. 6. Mark the pin board (first time I did it with the saw in the kerf like Saint Roy, second time I use scratched it in after cutting the tails.) Also use marking gauge here to mark all sides with the thickness of the board. 7. Cut down with the saw to the marked line. 8. Chisel out the waste again, and clean up the lines.